(March 12, 2019) - Welcome back everyone from a pretty long layoff. I think this is the longest we've gone without updating the webpage, but hopefully you'll understand why once we go over the progress we've made since December (happy new year, by the way). 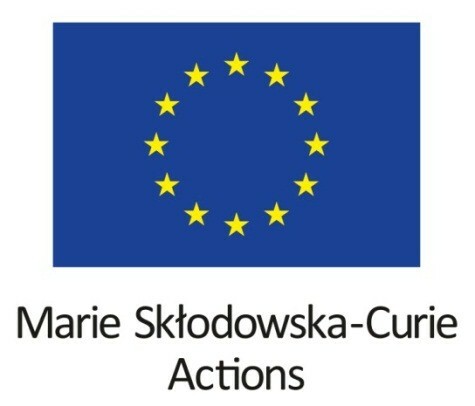 To give you an idea of where the project is at, the research tasks are expected to end at the end of this month. This includes any data collection, experiments, publications, and so on. Starting in April, we plan to move into the development phase of the project where our CAD WALK prototype gets upgraded into a real commercial product. As we enter this transition, there is plenty that has been done, and much more to go. 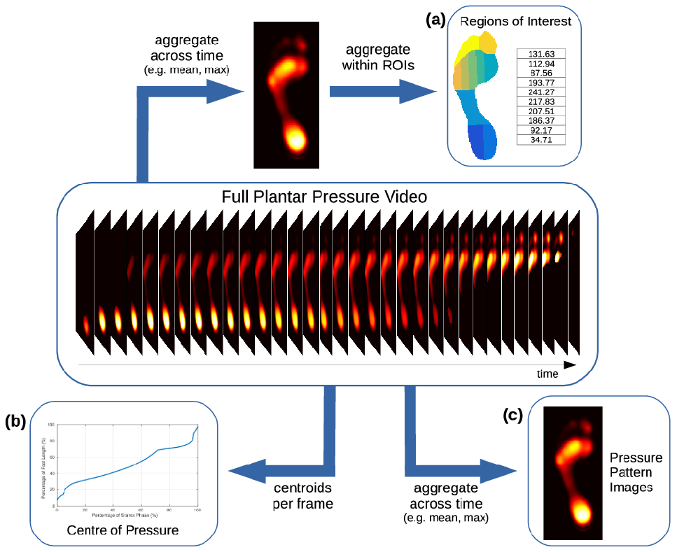 Publication Alert: The Journal of Biomechanics recently published our scientific article titled, "An assessment of the information lost when applying data reduction techniques to dynamic plantar pressure measurements". This article really lays out our motivation for pursuing this CAD WALK project: it shows that traditional foot pressure analysis techniques are incomplete. To explain why, I need the picture to the right. A full foot pressure measurement is a video like the one on the middle of this picture, a video that captures pressures over the whole footstep over time. This video is a lot of information to sift through in an attempt to find the information about your foot that will be clinically valuable. As a result, researchers and clinicians try to simplify the video by reducing it to either (a) an small set of numbers, (b) a time curve, or (c) an image. This "reduced" representation is then what gets examined for clinically-relevant information. We have wondered for a while what the impact might be when you reduce the pressure video to a simpler representation. Do we lose a lot of information about the foot? Is the lost information just extra details, or are we losing whole phenomena? Would any of that lost information be clinically useful? Well, our resent paper suggests that these reductions to the pressure video are discarding large chunks of information, some of which could even be useful for clinical diagnosis. It is for this reason that CAD WALK attempts to analyze the whole foot pressure video, highlighting the pressures that appear abnormal. Is is also why we pursued the project's preliminary version in our previous journal article. Data Collection and ISBI 2019: We continue to collect foot pressure data from our patient populations. Just yesterday, we completed our measurements of 50 Hallux Valgus patients, all of whom were measured before clinical intervention. We are currently in the process of organizing that data and doing some quality control checks to make sure all the measurements are ready for use in experiments. Once that process is complete, we will update our existing Hallux Valgus dataset that we published last October. 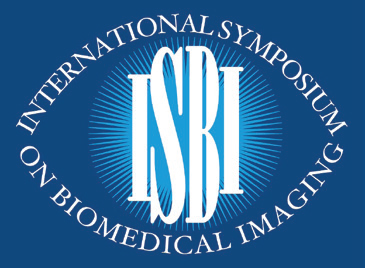 We will also be promoting our database of foot pressure measurements at the International Symposium on Biomedical Imaging next month in Venice, Italy. As part of the symposium, we will be presenting an abstract on the database itself, how we collected data for the database, and what we hope to accomplish by sharing this data with the rest of the research community. We are also inviting others to participate in growing this database by adding their own foot pressure measurements. The more measurement we have, the more we can learn about how the foot functions and, hopefully, the more able we will be to diagnose foot complaints. As expected, the project continues to progress on a variety of fronts. We continue to negotiate an IP agreement for the CAD WALK development. We continue to submit articles, abstracts, and demo applications to a variety of venues in order to show off our technology. In fact, we hope to have more successes to talk about in our next status update. See you then! We will publish our finalized dataset of pre-surgery Hallux Valgus measurements. We hope to have an IP agreement in place. We expect to announce additional publications and presentations. Stay tuned!